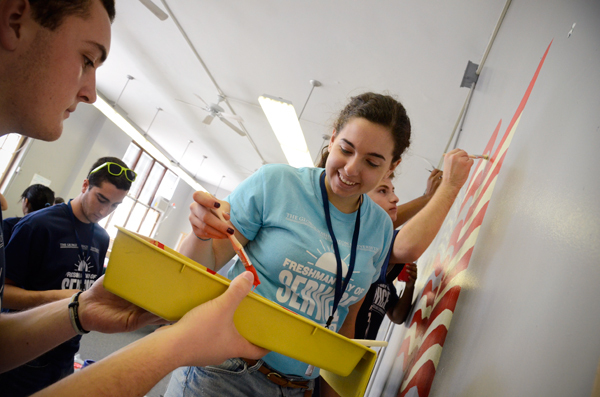 Before future GW students graduate, they could be required to prove leadership skills they gained from running student organizations or community service projects, as well as create a portfolio of their experiences. Administrators will weigh these changes as they hammer out how to ingrain leadership and citizenship skills into every student’s curriculum as part of the decade-long strategic plan. The University has ruled out a mandatory leadership course or community service hours – which are already required of student-athletes – but Provost Steven Lerman said a task force will mull over how to convince more students to collect and show off leadership experiences. GW could count leadership workshops or participation in leadership academies. Lerman said the activities would stretch across a student’s four years at the University and be documented in a written portfolio. Students could choose from a list of approved activities or propose their own to the University. “I don’t see it as a class. I don’t think one best acquires the attributes of citizenship and leadership through a single classroom experience. I think you acquire it experientially, but in a constructive way,” Lerman said. The group of faculty, students and staff will report to Lerman by the end of the year. The finalized program could roll out the following year. Vice Provost for Diversity and Inclusion Terri Harris Reed will lead the task force. Deans from every school will recommend faculty members, and members of the Student Association and the Office of Military and Veteran Student Services will suggest sophomores and juniors to sit on the committee. Reed said the group would also consider programs at other schools. Lerman will select appointees to the group in the next week, and they will host a series of campus-wide town hall meetings this spring. Students could also contribute to a blog, attend discussion sessions or write a capstone paper to document their leadership activities, Dean of Student Affairs Peter Konwerski said. “How do we help students process, digest, reflect – whatever word you want – the experiences they have out of the class and link them to what they’re learning in class a lot around leadership theory, citizenship, being engaged?” Konwerski said. This article appeared in the February 3, 2014 issue of the Hatchet.